Set custard dessert with a soft caramel topping that is served cold and with a wobble. This Dairy-free and Paleo recipe is made with almond milk and honey. 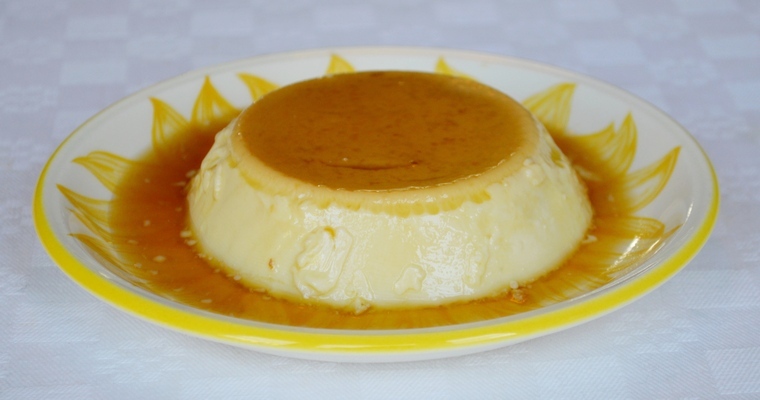 Crème caramel (or flan, as it is known in France and Spain) is a cold set custard dessert with a layer of soft caramel on top. This is achieved by pouring caramel into the bottom of the ramekin before adding the custard. Once cooked and cooled, the whole lot is inverted onto a plate so that the custard stands proud beneath a thin caramel crown, encircled by a pool of liquid caramel. Crème caramel is closely related to another classic French custard dessert, crème brûlèe. However, crème brûlèe has a hard and brittle caramel topping. 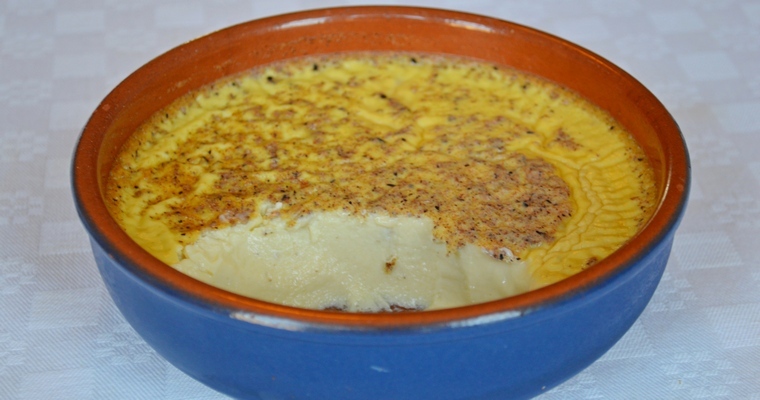 This is achieved by adding a sugar topping after the custard has cooked, and then briefly torching this until is becomes hard, brittle and brown. Crème brûlèe is served in the ramekins, rather than being turned out. This means that the texture does not need to be so firm, so the custard mix is richer and creamier (no egg whites are used, and cream may be added). 02. How do you make custard? 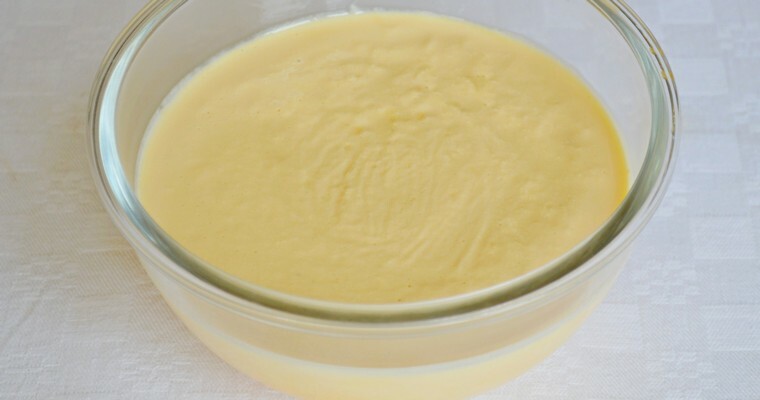 Custard can be either fluid or set, depending on how it is cooked. Pouring custard is a sweet dessert sauce that is served over hot desserts like steamed puddings, fruit pies and fruit crumbles. It is made by whisking hot milk into egg yolks and sugar, and then heating gently in a saucepan until the sauce is thick enough to cling to the back of the stirring spoon. Baked custard is served cold as a dessert in its own right, rather than as an accompaniment. It is more solid, as the egg and milk mixture is poured into a mould and cooked in the oven until it sets to a gel-like consistency. Because the desired consistency is solid rather than fluid, the recipe includes egg whites for their gelling properties. However, too many egg whites will increase the firmness while reducing the richness and softness, so they are only added at a ratio of 1 egg white to 3 egg yolks. 03. What causes custard to set? Reduction sauces like gravy are thickened by heating to boiling point to drive off the excess water. Egg-based sauces like custard are thickened by the proteins in the sauce rather than by evaporation. When heated, egg proteins coagulate to form a solid mass that acts as a gelling agent. You can see this principle in action when you crack an egg into a hot frying pan, or scramble eggs in a saucepan. Egg-based sauces are quite temperamental to cook, being sensitive to high temperatures. If the temperature exceeds 80°C/176°F, then the eggs overcook and scramble, resulting in a lumpy sauce that has a curdled appearance. But if the temperature does not exceed 70°C/158°F, then the egg proteins do not coagulate, resulting in a runny sauce. Making pouring custard on the stove requires patience and vigilance – it is not a thing that can be attempted while multi-tasking, as it must be stirred constantly to turn over the bits that sit over direct heat. 04. Why is baked custard cooked in a water bath? The danger of curdling is solved by cooking custard in a water bath. This simple technique involves pouring the custard into a dish, and then sitting the dish in a roasting tray half-filled with water. As the temperature of the surrounding water cannot exceed 100°C/212°F, the custard is insulated from direct heat. However, custard continues to cook for several minutes even after it is removed from the heat source. This is called carryover cooking, and refers to the fact that the residual heat from the exterior of hot food will travel to the cooler interior until an equilibrium of temperature is reached. This heat transfer exchange explain why pretty much all food benefits from resting, and not just meat. 05. How do I prevent baked custard from overcooking and weeping? While cooking times provide a useful estimate, they should not be slavishly obeyed. Instead, check for doneness by removing from the oven and giving the dish a gentle shake – if there is a slight wobble in the middle of an otherwise solid mass then it is done. Remember, the centre will continue to cook as it cools, due to carryover cooking. If you wait until the middle is fully firm before removing from the oven, then the centre will overcook as it cools. Overcooked baked custards ‘weep’ a clear liquid that collects at the bottom of the dish. This happens because the egg proteins have bonded together too tightly, squeezing out the water molecules. 06. Can you make dairy-free baked custard using nut milks? Nut ‘milks’ are an emulsion of ground nuts and water. They are made by grinding nuts to a paste and mixing vigorously with water until fully blended. The mixture is then strained through a fine mesh material. Just like egg-thickened sauces, nut milks do not respond well to high temperatures. If you heat nut milks all the way to boiling point, the heat-sensitive emulsion breaks down. This causes the finely ground nut particles to separate out from the water, resulting in a grainy texture. As egg-thickened custard should not be cooked to a high temperature, this makes nut milk a perfectly acceptable substitute for cow’s milk. 07. Which is the best nut milk to use in custard? At its heart, baked custard is nursery-style comfort food. The slippery texture and delicate flavour signals blandness, and yet this unprepossessing dish has a luxuriously rich and creamy mouthfeel. It is the one dish I crave when I am ill. I’m not sure how much of this is because it is easy to swallow and digest, and how much is due to the fact that my mother always fed it to her little invalids! My point is that distinctive flavours have no place in a baked custard. Coconut, pecan and hazelnut milks produce sweet-tasting nut milks, while walnuts and brazil nuts produce bitter-tasting milks. The best nuts to use for baked custard are those that produce mild-tasting, buttery milks, such as almonds, cashew and macadamias. Out of this selection, almond milk produces the best baked custard. 08. How can I use up the leftover egg whites? Egg whites are used in cooking for their aerating and binding properties. They are comprised of 90% water and 10% protein. When whisked, the protein molecules trap air, which causes the volume to increase by up to eight times. This transforms the egg whites from a slimy, transparent gel to a light, white foam. When heated, the protein molecules bond together to create a strong matrix. Egg whites are therefore used primarily to create a light and fluffy crumb, or to stop dense ingredients from falling apart and crumbling. Put the honey and water in a small saucepan – preferably an enamel one with a pale-coloured bottom, if you have one, as this will make it easier to monitor changes to the colour. Place over a medium heat and stir for 1-2 minutes, or until fully blended. Turn up the heat to medium-high and boil, swirling occasionally, until the liquid turns a deep amber colour – about 15-20 minutes. Keep an eye on it as soon as it starts to colour, as you don’t want to burn it. When done, the liquid should have thickened and feel tacky when you drag a wooden spoon along the bottom of the pan. Pour the caramel into 4 ramekins with a capacity of at least 200ml, or a 900g / 2lb loaf tin – the recipe makes about 800ml. Leave to cool for 15 minutes. Pour the milk into a saucepan. Slit the vanilla pod in half length ways. Scrape out the seeds with the tip of the knife and add to the milk, along with the pod. Heat slowly over a gentle heat to just below boiling point. Take off the heat. Fish out and discard the vanilla pod. Whisk the eggs yolks and honey until fully blended. Gradually pour the hot milk over the eggs in a thin stream, whisking constantly to prevent the hot milk from curdling the eggs. Keep whisking until fully blended. Push through a fine-mesh sieve to remove any lumps. Lightly grease the sides of the ramekins above the caramel, then pour in the custard. Cover with tin foil to stop the top from becoming crunchy. Arrange the ramekins in a roasting tray, leaving some space between each ramekin. Pour in just-boiled water from the kettle around the ramekins, until it comes about half-way up their sides. Transfer to the lowest shelf of the preheated oven, where the heat is gentlest. Bake for about 30 minutes, until the custard is just set. Test by giving a gentle shake – if there is a slight wobble in the centre of an otherwise solid mass then it is done, otherwise return to the oven and re-test in another 5 minutes. If cooking in a loaf tin, rather than individual ramekins, check after 1 hour 20 minutes. When done, remove from the water bath and leave to cool on a wire cooling rack. Cover with plastic wrap and refrigerate overnight. The crème caramel will keep well for up to 3 days in the refrigerator. To serve, run a small knife around the sides and quickly invert onto a plate. For best results, remove from the refrigerator half an hour before serving. Thank you very much for this recipe and detailed info. Creme caramel is my favorite dessert that I miss it so much, I can not tolerate gluten, dairy and some other foods anymore. I try to remember that last time I had creme caramel must have been 2012. I’m looking forward to making these. I shall get all the ingredients and try this asap. I hope you enjoy it . If you can eat refined sugar, then using white sugar instead of honey will result in a more neutral flavour (probably closer to what you remember from 2012!). But , personally, I like the flavour that honey brings to this dish. Rwth, I made the cream caramels yesterday refrigerated them over night. After a long wait we ate them today and they were divine! Recipe works %100. I forgot to cover the ramekins with foil , they came out fine. The caramel was a little soft and slightly juicy which I didn’t mind. I should’ve cook the caramel a little longer . I used the egg whites; tried your almond cookies, they are a little soft but taste nice. I didn’t use orange zest. Thanks again for the great recipes.